New! The festival has expanded throughout the Riverside Campus with 5 fun-filled magical areas for all ages! This family friendly event supports the education and outreach programs of Riverside Children’s Theatre. Step into a world of glittering Christmas trees as you experience the Vero Beach community’s welcome to the holidays, our 19th annual Festival of Trees "STARRY, STARRY NIGHT." This year’s theme, will be reflected in each creative design. Designer decorated trees, wreaths and Santa's Village are some of the highlights along with holiday shopping, children’s activities, live entertainment, food and drinks, a community songfest, and some new surprises soon to be announced – as this year's festival expands across the entire Riverside Theatre campus. The Gala Preview Party kicks off Festival of Trees weekend with a festive cocktail buffet, hors d'oeuvres, open bar, a holiday sing-a-long and the opening of silent auction bidding on the decorated trees. Plus a special rock'n holiday performance of the wildly popular Howl at the Moon dueling pianos music show. THE FESTIVAL HAS EXPANDED THROUGHOUT THE RIVERSIDE THEATRE CAMPUS! Riverside Children’s Theatre is transformed into a magical forest with over 50 beautifully decorated trees that will be available to purchase during our silent auction all weekend long. Designers from all over the area volunteer their time, talent and treasure to create these unique, holiday masterpieces. Vendors selling holiday decor and much more are spread throughout the Forest. The gingerbread village, a magical mix of large and small creations, is always a focal point in the display area and completes any home holiday décor. FREE PIZZA, HOT COCOA and CANDY for the KIDS! Have a blast in Santa's Village under the oak trees, in front of Riverside Theatre. Visit Santa in his Vero Beach Workshop! Plus enjoy holiday lights, decorations, live entertainment, fire-grilled sandwiches, full bar, games & prizes, and children's ice skating rink! (There will be a $3 skate rental fee). Call 772-231-6990 for more information. Riverside Theatre’s main building will be a hub of activity with the Hall of Wreaths, the Community Stage on the Waxlax Stage, with performances by local choirs, and classes and demonstrations of holiday projects by local artisans on the Stark Stage. The ever-popular Christmas Shoppe is the one stop location for unique gifts, gourmet cheeses, jellies, and holiday cheer. 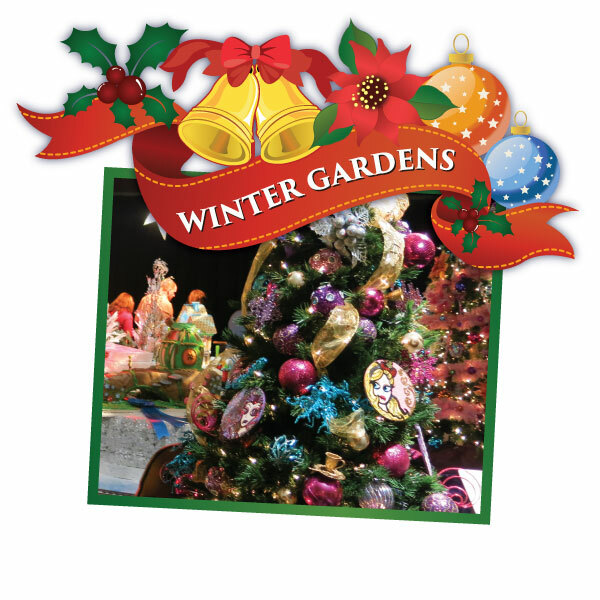 New this year, Winter Gardens will be an exclusive area showcasing holiday plants, outdoor decorations and a fun family activity and photo area. This annual treat for the whole family includes a visit with Ole St. Nick, musical performances, and a delectable full catered breakfast. Plus... admission to the Festival of Trees showcase is included.